What are the different types of water pollution? The purpose of this page is to give a brief overview of the basic types. However, our primary focus on this site will be to uncover water pollution solutions—both on the individual as well as global level. Thus, we will also explore the causes and effects of water pollution via other articles on this site. Our hope is that many visitors will become actively involved in this discussion and help us get the word out as quickly as possible. 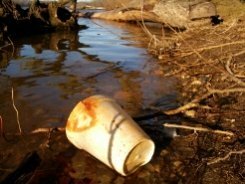 If water pollution comes from a single source such as a factory’s waste or oil spills it is called point-source pollution. If it comes from many sources, it is called nonpoint-source pollution. Most types of water pollution only affect the immediate area but sometimes the pollution can travel hundreds or thousands of miles and then it is called transboundary pollution. These different types of water pollution come from varied sources: surface water, groundwater, microbiological, oxygen depletion, nutrient, suspended matter, and chemical. Surface water pollution is the most visible form of pollution and we can see it floating on our waters in lakes, streams, and oceans. Trash from human consumption, such as water bottles, plastics and other waste products, is most often evident on water surfaces. This type of pollution also comes from oil spills and gasoline waste, which float on the surface and affect the water and its inhabitants. Water contaminants from fracking include a range of toxic chemicals, methane, benzene, and radiation. This type of pollution is becoming more and more relevant because it affects our drinking water and the aquifers below the soil. Groundwater pollution is usually caused by highly toxic chemicals and pesticides from farming that leak through the ground to contaminate the wells and aquifers below the surface. Microbiological pollution is the natural form of water pollution that is caused by microorganisms in uncured water. Most of these organisms are harmless but some bacteria, viruses, and protozoa can cause serious diseases such as cholera and typhoid. This is a significant problem for people in third world countries who have no clean drinking water and/or facilities to cure the water. Microorganisms that thrive in water feed on biodegradable substances. When there is an influx of biodegradable material from such things as waste or erosion from farming, the numbers of these microorganisms increase and utilize the obtainable oxygen. When these oxygen levels are depleted, harmless aerobic microorganisms die and anaerobic microorganisms thrive. Some of these organisms produce damaging toxins like sulfide and ammonia. Nutrients are usually found in wastewater and fertilizers. These can cause excess vegetation in the water such as algae and weeds, using up the oxygen in the water and hurting the surrounding marine life and other organisms in the water. This type of pollution occurs when pollutants enter the water and do not mix in with the water molecules. These suspended particles form fine silt on the waterbed, harming the marine life by taking away the nutrients and disturbing their habitat. Due to the nature of industry these days and the mass production in industrial plants and farms, we have a lot of chemical run-off that flows into the nearby rivers and water sources. Metals and solvents flow out of factories and into the water, polluting the water and harming the wildlife. Pesticides from farms are like poison to the wildlife in the water and kill and endanger the aquatic life. If birds or humans eat these infected fish, the toxins are transferred to us and we swallow these dangerous pesticides and toxins, affecting our health. Petroleum is a different type of chemical pollutant that dramatically affects the aquatic life. This oil kills the fish and marine life and sticks to the feathers of birds, causing them to lose their ability to fly. Most water pollution is typically blamed on big industries. However, recreational and agricultural pollution are also largely to blame as our aquatic life suffers and species go extinct. To see what these pollutants are doing to our ecosystem and how they are affecting our health, check out the additional articles below to find out how you can help cut back on your daily contribution to water pollution. Radioactive Water from Japan’s Nuclear Power Plant - Does It Affect People in the United States? Safe Drinking Water Act - Protecting Tap Water in the U.S.